This year marks 30 years since the Chernobyl nuclear accident. Vast amounts of radioactive particles spread over large areas in Europe. These particles, mostly Cesium-137, cause a low but long-term exposure to ionizing radiation in animals and plants. This chronic exposure has been shown to decrease the abundances of many animal species both after the Chernobyl and later Fukushima nuclear accidents. Damage caused by acute exposure to high radiation doses have been demonstrated in numerous laboratory studies, but effects of chronic exposure to low radiation in the wild remain largely unknown. New research now suggests that chronic exposure to low radiation can cause damage to the eyes of wild animals. This is shown in an international study led by researchers Philipp Lehmann and Tapio Mappes from the University of Jyväskylä, Finland, which recently was published in the journal Scientific Reports. In the study higher frequencies of cataracts were found in the lenses of bank voles which had lived in areas where background radiation levels were elevated compared to areas with natural radiation levels. Cataract frequency increased with age in the voles, similarly as in humans generally. In addition, the effects of aging intensified as a result of elevated radiation. Interestingly the effect of radiation was significant only in female voles. Also in humans there are indications for high radiosensitivity of lenses. Persons with occupational exposure to radiation, such as radiology nurses, nuclear power plant workers and airline pilots have increased risk of cataract, but potential gender differences in radiosensitivity should be further studied. Reasons for the gender differences in wild mammals are still largely hypothetical. However, the present study suggests that increased cataract risk may be associated with reproduction, as female bank voles who had severe cataracts received fewer offspring. Whether poorer reproductive success was caused by cataracts or by radiation is still unclear, and will require further experimental studies. Nevertheless these new results support observations of negative consequences of chronic exposure to low radiation on wild animals and whole ecosystems. Studying effects of chronic exposure to low radiation in natural ecosystems is highly important, as it will help to prepare for new nuclear accidents and predict their consequences, which can entail widespread effects that can persist for hundreds of years in nature. "areas where background radiation levels were elevated compared to areas with natural radiation levels." In some areas, the natural radiation is more intense than Chernobyl with no health impact on both native wildlife and humans. "A 2009 study of background radiation and cancer incidence in Kerala conducted by the Regional Cancer Center in Trivandrum, Kerala, India concluded that 'In site-specific analysis, no cancer site was significantly related to cumulative radiation dose. Leukemia was not significantly related to HBR, either.' "
This known hazard for catarats seems well known if not publicly acknowledged. Oh, I forgot --your entire kindergarten-level strategy is to is to generate doubt with unsupported claims, paraphrase, and reflexive attribution. ALL of the ongoing, long term studies being carried on in CHERNOBYL do, indeed, indicate increased levels of many radiation-linked pathologies in the indigenous fauna(and flora), as well as mutation and assemblage changes since study began. ..indicate increased levels of many radiation-linked pathologies in the indigenous fauna(and flora), as well as mutation and assemblage changes..
"increasing cases of leukemia and other cancers, and multiple deaths of farm animals in these contaminated areas." "There have been reported cases of radioactive exposure that cause birth defect and leukemia cases at rare earth refinery plants." What is it with the folk who try to impose this dangerous technology on us? What is their motive? Why the silly effort to lock us into a technology we cannot completely control, and one which can kill us, . . . all of us? Why do you do it, Willie? Have you been in the business? Are you being paid? There must be some real reason, not the pap you post here. I oppose it because I understand it, and have worked with some of it. What is it with the folk who try to impose this dangerous technology on us? What is their motive? 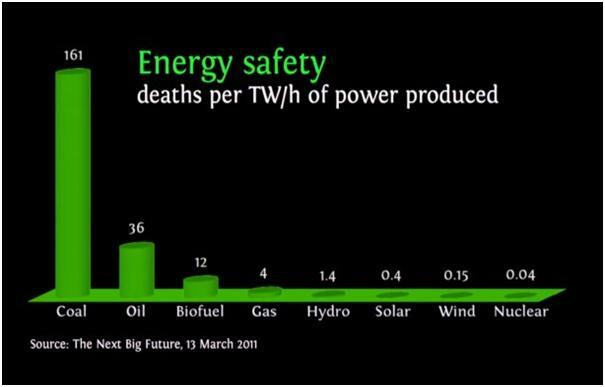 Wind/solar is backed by oil and coal that make it far even deadlier than nuclear. Their motive: green money, ideologies/prejudice/ignorance, vested political interests. "Why the people in Chernobyl are lucky to have a nuclear power plant"
"Even with the Chernobyl catastrophe about four times more people could be expected to have died if the nuclear power plant had been a coal power plant instead"
Why yes, and instead they were only just barely saved from being completely eradicated and their former idyllic home reduced to a smoking, strongly radioactive crater in the peaceful Russian countryside. Now, the entire area is virtually devoid of humanity, and all the other life in the area exhibits the effects of acute, followed by ongoing radionuclide exposure. Your brilliance is boundless, dubyadubyaMAROON. Nuclear provides cheap and safe energy to Russian children and their families to keep them warmed during the winter, because wind/solar is far to provide it at reasonable prices with no environmental impact on wildlife's habitats. "The more people know about nuclear power, the more they favor it." "Nuclear power is safe source of electricity"
"Nuclear has the lowest deaths per Terawatt-hour (TWh; 1 billion kilowatt-hours) of electricity generated"
"Nuclear has very low greenhouse gas emissions"
"Nuclear produces tiny amounts of nuclear waste" "The U.S. nuclear industry generates a total of about 2,000 – 2,300 metric tons of used fuel per year." "If these used fuel assemblies were stacked end-to-end and side-by-side, they would cover a single football field about eight yards deep"
All the nonsense of Willie cannot change what nuclear power has done to the animals and children of Chernobyl. Even with incidents, myths/beliefs and fictional data against it, nuclear power is proven much more ecologically friendly as it does not disturb wildlife's habitats/natural landscapes, neither slaughter millions of birds and bats as wind/solar does. "Chernobyl Wildlife Thriving Decades After Nuclear Accident"
"Wolves, they add, are seven times more populous than animals in those radiation-free areas." "Renewable energy kills a lot of birds while saving the planet"
That's it, --keep on bloggin', magicalMAROON. Yeah! the truth is upsetting, wind/solar is more harmful to plants and animals than nuclear power. "Many 'wind farms' are located in areas that are also the corridors for migrating birds." "independent studies have determined the rotating blades of giant wind turbans do, indeed, kill upwards of a half-million birds and bats annually. While from a distance the rotating blades seem to be moving rather slowly, in fact the tips of the largest ones are traveling one hundred eighty miles an hour, far faster than a bird can normally fly. Raptors (hawks, owls, etc.) are especially vulnerable." Your blogs are no more compelling today than they were a week ago, dubyadubya magicalMAROON. What's the matter --did you accidentally delete your file of denierside readymades? "Naturalist opposes wind turbine system in bird sanctuary"
I agree..but call him a moron, not a maroon. Maroons are something else. Sievert is a unit of dose that is scaled to the biological effect - so it is not the same as the energy absorption (which is the radiation dose measured in Gray). Nukes cause problems everywhere with every living thing. Nuclear development was done in hate and fear, and now we are stuck with this terrible technology, purely out of money and Big Power, in the form of corporations. Having invested hundreds of billions of dollars in this foolish prank, we have to live with the corporate monsters we have created and what we have produced, . . . essentially forever..
As a utility engineer in Technical Services, I gave tours of the wind farms at Altamont thirty years ago, . . and now my eyes are a little worse. I hope nobody tells Willie! cause problems everywhere with every living thing. If at least a small fraction of what is said by scaremongers were true, thus all mankind would already be dead. wind farms . . and now my eyes are a little worse. It is good as you are not able to see the destruction of natural landscapes. Does doesn't work that way. It works probabilistically. So yes: you can (and must) use the argument that way. The cell replacement is exactly the problem, because cancer is when cell division goes wrong (e.g. due to having been damaged by radiation beforehand). The only thing that is different with fast exposure vs. slow exposure is radiation sickness - but that is an entirely different issue. 60 microsievert/hour is 0.125 sievert per year. Most of the time, cancer origin has nothing to do with radiation. "Sometimes mitosis can go wrong and cause cancer cells to develop" and radiation is employed as the cure of cancer. "Radiotherapy can be used to treat some medical conditions, especially cancer, using radiation to weaken or destroy particular targeted cells." "Tens of millions of nuclear medicine procedures are performed each year, and demand for radioisotopes is increasing rapidly." Why don't you see if you can dig up any blogposts regarding the causation of moron. Is there any link with radiation? I realize this will be a tall order for your limited troll intellect, but we all know you've got the time. Apparently, that's all you've got. and radiation is employed as the cure of cancer. Yes. You use radiation to kill cells. The tradeoff is that you irradiate surrounding tissue (something that can't be totally avoided, though there are some really neat ways of limiting it). What this means is that you *may* kill a tumor that is in a stage where it is immediately life threatening while putting in radiation on healthy tissue which increases the chance of *future* tumors. It's a similar tradeoff you make with X-ray images or CT scans: How much will the image help in a diagnosis as opposed to the increased risk of cancer you are subjecting the patient to? This is why such acqusitions aren't just done willy-nilly and the dose is recorded and archived for each patient (at least in most countries). Bullying stratagems to dissuade the truth. Lamentable! Conspiracy theories/myths/beliefs versus real data. "The median annual doses were estimated to be 0.63–0.97 mSv y⁻¹ in Fukushima Prefecture, 0.55–0.87 mSv y⁻¹ outside of Fukushima in Japan, 0.51–1.10 mSv y⁻¹ in Europe (0.09 in Belarus), thus demonstrating that the individual external doses currently received by participants in Fukushima and Belarus are well within the terrestrial background radiation levels of other regions/countries." "Measurement and comparison of individual external doses of high-school students living in Japan, France, Poland and Belarus"
It's not bullying when the target is a bully. It's bullying to cut and paste the same spew to force your inane hypotheses into the discussion. Radiation must also cause a moral blindness in people, so they do not see the burden they leave for all of Humanity, essentially forever in Human terms. Perhaps rbtwjohnson would like to go to Fukushima to help? Before he does, I suggest he look up Chernobyl Children. Oh, oh, . . a dangerous event occurred at a wind farm, when a 100-foot turbine blade broke off. No towns were evacuated, no toxic or intensely-radioactive agents were released, and the cleanup is immediate. Compare that with Fukushima and Chernobyl. We simply cannot afford the Faustian Bargain of nuclear technologies. People have an irrational fear of nuclear in a same way they have fear of shark attacks, but for each shark attack, there are over 300,000 dogs attacks with 20,000 deaths, but even so, they are not so afraid of dogs. Because they are informed about dogs, they love dogs, while are misinformed about sharks' behavior. If people get more informed about nuclear power, they will love it because it causes fewer fatalities than shark attacks, it is safer than wind/solar per gigawatt produced. Three Mile Island killed exactly zero, and no one has died as a result of the Fukushima radiation. So they will be not so influenced by scaremongers and sensationalist mass media that induce abortions, anxieties, heart-attacks, suicides, provoking more deaths than radiation. Concerns regarding the safety of nuclear technologies are not irrational, Toots. Did you look up "Chernobyl children"? It is remarkable how anti-nuclear/pro-renewable people lie a lot, truly believing in their own fibs; the most important thing for them is their convictions and beliefs and not how the things are in fact. fact: wind/solar kills indirectly more children than nuclear as it is backed by fossil fuels. Oh, now Willie has abandoned the high ground, and wants to contest alternatives because they have to be backed up by the present system? You mean like the nuke plants during their refueling or turbine trips? Gosh, Toots, we can't do it all at once. pedal-powered cars? No, yabba dabba doo. fossil-fueled cars? Yes, at least two. My car is solar-powered, Toots. Where are your nuclear cars? Your car and your home are partially nuclear-powered. Nope: No coal. You are getting the wrong information, or do not know how to differentiate between sources and agencies. I produce most of my car power and all of the house energy. And it is still in February. We had planned on only providing 95% of house use, but the system is over-producing, happily. I see "lord" jag disagrees. Can we get that in words? You are on the wrong article Cher. He did not vote over here. Well who the heck you think it was? He's got my name right there beside it. Oh, good, now you can tell us why you had to rate it down. Because it was really dumb Cher. Naa, not me. I am usually pretty much the same ol calm Ira-Skippy. "Because it was really dumb Cher. " Yeah, producing my own clean electricity and powering my house and car with it is "really dumb" to the goobers in the swamps. You just stay connected and dependent on The Man. Not me. I used to be his technical guy, and now can do it by myself. Oh yeah, I almost forget. That one was really dumb too. It fit your responses perfectly. The really dumb thing was for you, an alleged champion of the Earth, to denigrate me, one who has worked for it for decades. Your little pique did it, right? Your little ego would not let you admit I was right, so now, you have to argue against what you really do believe. This is why folk develop character, Ira. So we do not find ourselves in your position. denigrate me, one who has worked for it for decades. You don't help Cher. You make the topic the laughingstock by all your Sarah-Palin-Like blurts and blahs. Your little pique did it, right? I am the one that is having a good time and doing just fine and dandy.You are the one who is always grumpy and whining. Pick on that for awhile. My little ego doesn't hold a candle to your GREAT BIG EGO.You are the one who spends all day every day talking about the wonderful glam-Skippy. Where I done that? You mean noticing you are the couyon? This is why folk develop character, Ira. So we do not find ourselves in your position. My condolences for that, but it's too late in your life to try to choot for my position. Hopefully when I am your age I'll have more to do than wish and reminisce on the interweb all day. Well, when I was your age, I had to work, and not get to play little semantic games with others all day. In 1982, age 38, I was going from Energy Services Engineer in a program to Senior Energy Services Engineer in Technical Services for Pacific Gas & Electric. I had already done all the other stuff, except for the later 20 years of training and troubleshooting for power companies. But you keep on playing these games at work. We all find our own level. Off course you were and did. We are all in awe at your success. Cher somebody that has to spend so much time telling us what wonderful things did, over and over and a lot more overs too, has a really big problem. ]But you keep on playing these games at work. Right now I am not at work, but when I am at work sometimes it is humming along good so I find time to notice you. What's it to you anyhoo, you are not the one paying me. We all find our own level. To bad nobody notices and ooohs and aaahs about the wonderful level glam-Skippy wishes he had found. Thanks for that, I will try to remember to be more careful me. Still clinging to those double standards, eh Cher? It must be hard for you when peoples don't know about that the glam-Skippy "Double Triple Standard Rule". Contrary to popular psychopathic belief, lying about your expertise and credentials is not a good way of gaining trust and support for your cause. -all of whom thought they were above the law. Psychopaths - the biggest problem.